At one point I have talked about my problem with over thinking things , scaring myself, and then abandoning the original plan because I created an elephant out of the fly and decided that the obstacles that I am faced with are immovable. I even put myself in front of a challenge to not over think things for a month. Let me tell you, it was very, very hard and I am not sure that I was as successful as I intended to be at the beginning. Recently, I embarked on a journey of not only bettering my mind and body, but also on a journey of developing and growing my business. I noticed that my habit of over thinking and making my challenges seem larger than they are is actually putting me behind the curve when it comes to my professional life as well as when it comes to my athletic abilities. The only way I know how to combat this irrational fear is to simply ignore it and push forward despite the sheer terror that I experience sometimes in the face of difficult circumstances. I wonder how things would be if I didn’t have to expand my energy on relentlessly perusing what I set out to achieve, if I didn’t find myself all but paralyzed by my insecurity so often? Is there another way to combat self doubt? A better way to stare failure in the face and not flinch? I don’t know. However, I am determined to find out one way or another. 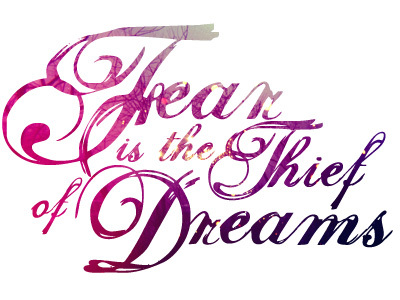 I refuse to be defeated by something that only exists in my imagination! Rest days. Some of us love them, some of us can’t wait until they are over and our normal week begins. I fall in the latter category. Imagine my disappointment when my doctor told me to stay away from running and other impact exercises until my shin splints heal. I was devastated. No, it doesn’t sound like the end of the world, but for a run addict it is worse than the end of the world. What do you mean I can’t run? Are you insane? Cross training? Do you want to kill me with a teaser of an exercise without proper release of all this beast mode, pint up energy? No, no, no, no, no! Let me at it! Let me run! But alas, I had to listen to the doctor. There I spent 9 weeks in physical therapy, doing my exercises, not running or jumping or doing anything else that would aggravate my aliment. If being away from the road wasn’t hard enough, the prescribed amount of running after the awful, long break was laughable. Start with a mile and build up by a mile every week. 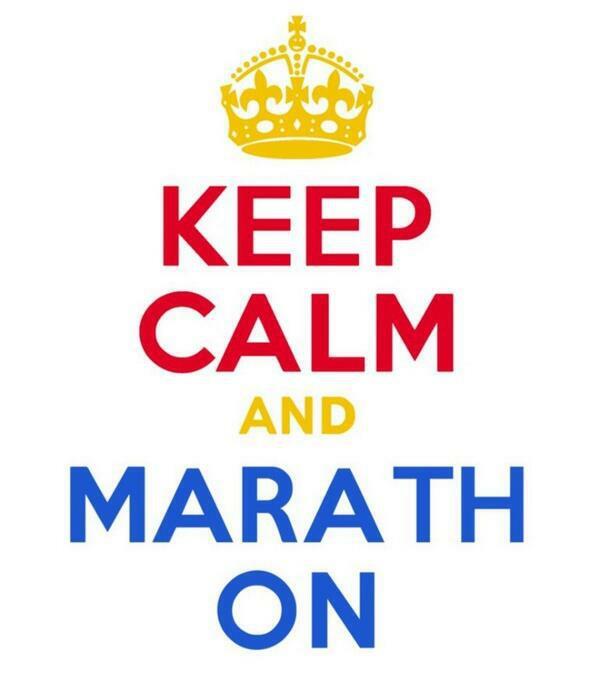 That is for a person who began her half marathon prep! I was going nuts! Running that one mile for the first week was equivalent of eating just one Hershey Kiss — frustrating. You just get a taste of how awesome this run is going to be and then you have to stop and go home, it wasn’t even a warm up! Regardless of my frustrations, I did as the doctor told me. I built up slowly, continued my therapy exercises, stretched, rolled, iced, took anti-inflammatory medication, invested in new shoes and insoles, took my calcium and vitamin D and up until recently was enjoying a fairly pain free running existence. The key words here are “until recently”. On Tuesday of this week I came home after my metabolic workout, took off my compression calf sleeves, and found a large, purple bruise set a few inches above my ankle. The first thought that went through my mind was: “Oh, no! Not a shin fracture!” The second was: “I have to get to the bottom of this! I can’t keep having my running goals derailed by my body.” I immediately went to go look for a highly rated podiatrist in my area and made an appointment for Monday afternoon. In the mean time, I decided to do extensive research on my incredibly frustrating, shin splint condition. 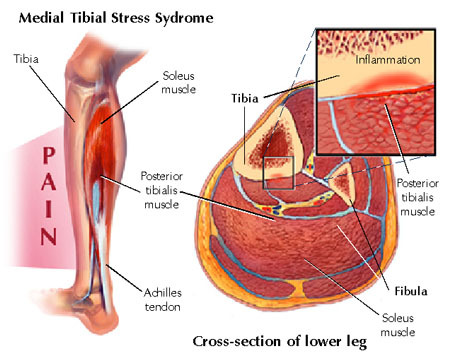 Medial Tibial Stress Syndrome (MTSS) is commonly known as “shin splints” and is one of the most common lower leg injuries among athletes and dancers. Shin Splints occur when the tibia and the surrounding muscles undergo repeated stress and do not have time to properly heal and recover from repeated muscle contraction and strain. MTSS usually presents as a dull, wide spread pain along the inside of the lower leg (middle-distal tibia) during impact exercise. In the early stages of MTSS the pain is worse at the beginning of exercise and subsides as the exercise progresses. I know some runners out there are saying to themselves right now: “pssht, I’m a runner! Pain is part of our existence especially if it dissipates as I warm up!” Don’t be fooled! Although the pain might temporarily subside, continued aggravation of an overuse injury can lead to serious consequences like stress fractures and mild to severe pain that does not subside with cessation of exercise at sometimes persists even at rest. How did I get Shin Splints? In short, I don’t know. MTSS is a very personalized injury that can be caused virtually by anything from improper form to your genetics. In most cases MTSS is caused by improper form, an unusual increase in exercise or a sudden change in exercise surface (i.e. changing your running surface from trail to pavement). Inadequate nutrition can also be a contributing factor to MTSS especially in the cases where shin splints are a reoccurring injury. Bio-mechanical abnormalities such as: knee abnormalities, tibial torsion, ankle abnormalities, foot arch abnormalities, femoral anteversion can all put a person at risk for MTSS. Your doctor should perform a plethora of necessary tests to determine what the contributing factors of MTSS are in your case. Regardless of the cause, shin splints are an overuse injury and should be treated with rest. Most doctors will recommend that you decrease or stop all impact exercises for a period of 2 to 8 weeks. Other treatment methods like anti inflammatory medication, ice, physical therapy, or dry needling might be recommended. Is There a Cure for Shin Splints? Yes, there is a cure. 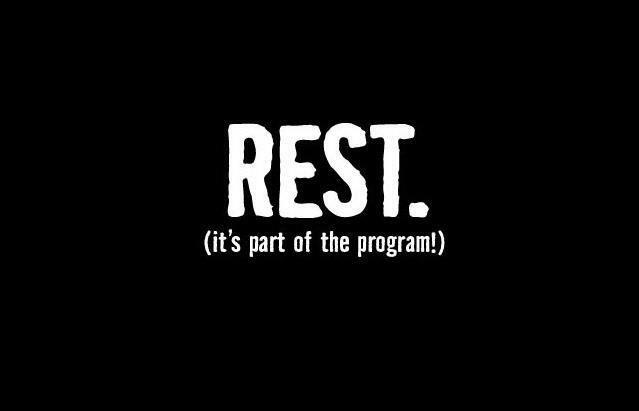 Rest and retraining. If your doctor and PT (physical therapist) have determined that you have bio-mechanical imbalances, you need to fix them as soon as possible. For example: most runners seem to have weak glutes. If that is indeed the reason you seem to overuse your lower leg, then you need to train your glute and hip complex to offset the load and so on. The most successful way to prevent MTSS is to address the reasons why it happened in the first place. So, if your form and muscular development is the problem, you need to get a running coach or a trainer and make sure that you learn the proper way to run/ train in order to prevent further flare-ups. But if I can’t Run I’ll Wither Away and Die! I use to think that too. I use to hate every hour that went by when I couldn’t go out there and run. I whined, I cried, and I was a very unpleasant person to be around when I was not logging regular miles. However, I did find an alternative to running that was not as good as the real thing, but in a pinch…. The day I found pool running I became a nicer person. No, it is not the same as going out there and feeling like a total badass while leaving hill after hill in your rare view, but it is something. Pool running works the same muscles as regular running but without all the impact. So, if your doctor and PT tell you not to run, ask them about pool running. Shin Splints can be extremely annoying and inconvenient but only if you let them. Just like dealing with any other sports injury, you need to look on the bright side, take the time to develop in other areas that you might want to use in the future. For example, if you know that you might want to do a triathlon in the near future, pick up biking and swimming. If lifting weights is your secondary passion challenge yourself to beat your max. Under no circumstances remain unoccupied. Forced inactivity can hurt more than the injury and lead to devastating results. So, if you are stuck with shin splints, concentrate on getting yourself better, do not skip PT sessions, do not push yourself to run through the pain, and most importantly get off the couch and go to the gym/ pool/ bike trail. Lean and Strong is The New Skinny and Fragile! Earlier this week I was at the store and picked up Women’s Health Magazine. I was astonished by what was in it. First and foremost what blew my mind were advertisements of soft, none developed, skinny women. Second, headlines such as “Flat abs in 15 minutes!” and “healthy cocktails” all but had me up in arms. I bought the magazine just because I could get at least 6 blog posts out of it just on the subjects of fitness and nutrition myths! Ok, ok, I am better now, but let’s face it, how can we battle the obesity epidemic when women are being fed conflicting and, at times, damaging information? You will be surprised how many women out there go to Cosmo for advice on fitness and nutrition. I did have higher hopes for Women’s Health Magazine, though. After all, the word “health” is in the title. It was extremely disappointing to see hundreds of glossy pictures filled images of women that were so retouched, they looked disproportionate. I am sure that I am not the only one that finds “skinny fat” absolutely unattractive. When did we lose touch with a healthy look? Why are we still holding on to an almost Victorian notion of a weak, helpless, anemic woman? Why can’t a girl have muscles? 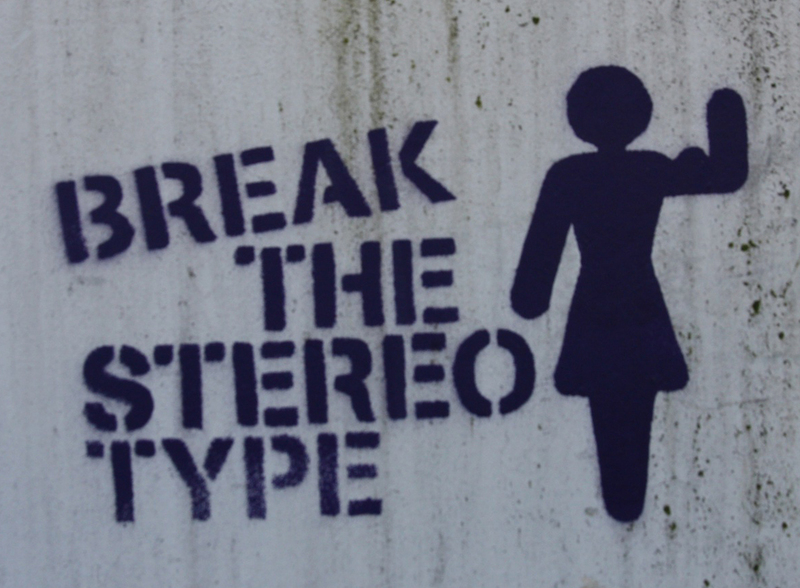 Why are we, women, allowing the society to continually define us as weak? Ladies, remember, you have the capacity to bare children! That alone propels you to a category of strength and resilience. Yu don’t have to carry the weight of the world on your shoulders, but wouldn’t it be nice if they were developed enough to hold it in case you did? Ladies, go to the gym and lift. Lean and strong is the new skinny and fragile! I am a runner. When people ask me what I do for a living, that is the first thing that comes to mind and only then what I actually do to support my lifestyle. I identify as a runner before I identify as anything else because running (physically and metaphorically) is at the heart and soul of all other activities that occupy my day. That is not to say that the only thing that I think, dream, eat, and breath is running, in fact that couldn’t be farther from the truth, but the lessons learned on the long tiring runs, and during short burst workouts can be applied just as much to life as they can be applied to running itself. When I first started running, I ran for fat lose, I didn’t run for me. I hated every step and every mile, I was a slave to the ideal body image that I had in my head and to the coveted single digit body fat percentages. I was lost, I had no idea what I was doing, I kept hurting myself for minimal amounts of gain and ended up with more body fat then I originally started with. I was making the same mistakes that every single female makes when they decide to become active: do minimal amounts of lifting and maximum cardio. I was on that treadmill for hours burning muscle and fat, tearing my joints, and then coming home and overeating thinking that I deserved it. Fast forward a few years of damaging fitness habits, emotional eating, lowered self esteem, I decided that enough was enough. I really buckled down, did my research and began an actual journey to a better me. Earlier this spring I wrote a post about my very first race and the inspiration, the support, and the love that I felt. That was the time when I knew that running was for me, but it wasn’t the time when I began identifying as a runner. The first time that I thought of myself as a runner was when my life was in an even bigger rut then it had before. Those were very dark times for me mentally and emotionally and I had nowhere left to hid and almost no one left to talk to. There are only so many motivational texts you can read and therapy sessions that you can attend before they start losing effect and become yet another unnecessary annoyance. There was a day when I was simply lost in the darkness of my own negativity and a tailspin of “why me?” when a surprising thought rang clear as day in the back of my mind: “you are strong, you are a runner, weak people can’t do what you do, push through”. The irony is, those were the exact same words I kept saying when I hit a wall at the end of a very tough race that I ran a few month prior. There I sat on the floor of my bathroom with a roll of toilet paper by my side, eyes swollen from hours of crying, stunned. There is a point in every runners life, when they are reduced to a state of absolute primal being. You are no longer a person, you are no longer yourself, you are an instinct, a set of basic and yet a very complex functions. You can’t think, you can’t process information (at least not the kind of information that does not pertain to the task at hand, moving your feet forward), the only thing that you can comprehend is that failure is not an option, that the finish line is coming and when you finally cross it, you get to collapse into a tiny pile of mortal flesh and embrace the post run cheering and pain that will inevitably come. The good pain that comes sweetened with the notion of ultimate achievement and the best tasting bagel ever! It is during the primal state that the “chant” or the mantra comes in for me. I guess somewhere between being mad at the unfairness of the world and beginning to cry my eyes out, I allowed the situation I was in to reduce myself to nothing more than a breathing organism and the autopilot kicked in. The runners autopilot: “you are strong, you are a runner, weak people don’t do what you do, push through…”. The realization of the fact that I thought of myself as a runner for the first time while I was feeling sorry for myself on the bathroom floor shocked me like and ice bath. Whatever my problem was before that realization, did not matter. I was a runner and I could push through. I pick myself up, washed my face, put on my running gear and went for a very long run. I was cured. From that day forward, regardless of discomfort, nerves, stress, or pain, there is only one answer: Go Run! The endurance that I learned though running allowed me to confidently press through my daily issues with less to no fear because I know what I am capable of physically and spiritually, I am no longer afraid to be afraid. The focus that I learned through running propels me towards my goals each and every hour of each and every day and I am that much more productive. Relentless desire to “cross the finish line” and runner stubbornness to keep pushing despite the odds helped me pursue some of the strangest and almost unrealistic goals. However, the most important lesson that I learned from running is to keep pushing through the up hills, because at the top of that hill, the downhill begins and I get to rest, recharge, and tackle the next hill renewed, stronger, more resilient than ever. Last week I wrote about a workout that defeated me at first and that I defeated a few hours after. This week I decided to share that workout with you. Be warned, this is not for the faint of heart. So, make sure that you are well hydrated, have plenty of energy and are ready to sweat. Have fun, don’t give up, and let me know how it goes! Do each round 2 times before moving on to the next round. Eating clean doesn’t have to be boring or difficult. I usually make extra protein for dinner and re-purpose it later in other dishes. This is one of those recipes that can easily be turned into a wrap, pulled chicken sandwich, lettuce wrap, chicken salad, garnish for salads, or added to a breakfast omelet. This chicken is easy to make, quick, delicious, and not to mention, it’ll save you a tone of time in your lunch and breakfast prep. Happy clean eating! Clean and cut away all access fat from the chicken breasts. Dry the chicken breasts and lay them out of a cutting board or a clean counter, season with Jamaican Jerk Seasoning, set aside. Preheat a skillet with olive oil until olive oil forms ripples on the pan when tilted from side to side. On high heat, sear chicken breasts until they turn golden brown. At this time, chicken breasts will still be raw in the middle. 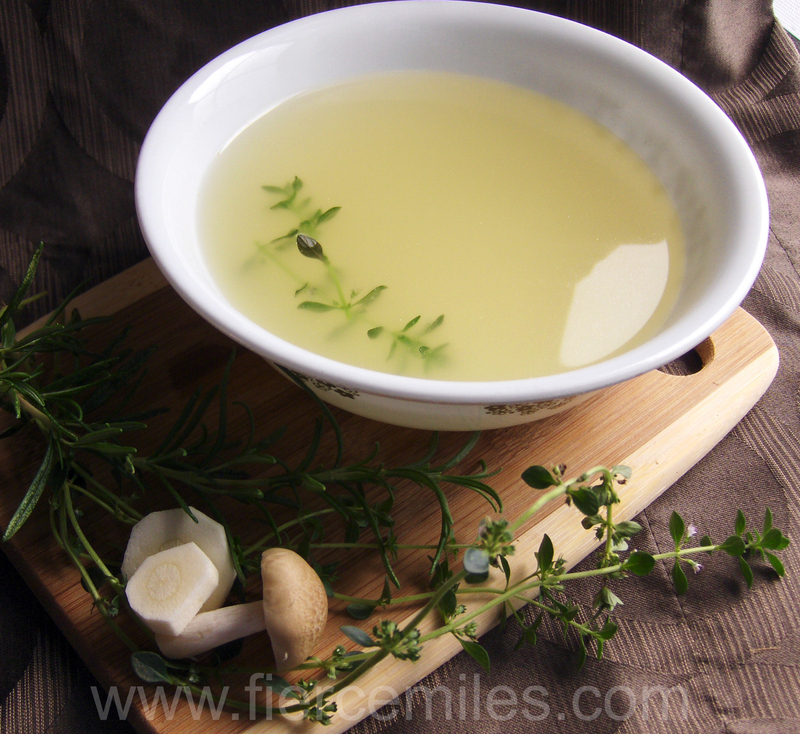 Turn down the heat and add chicken stock, a few sprigs of lemon thyme and rosemary. Cover with a lid and let simmer for 30 minutes.